Although I have not seen every best picture Oscar winner, I must honestly say that Cavalcade is the only winner whose title was unfamiliar to me. Interestingly, it is also the only film not available through the Carnegie Library system in DVD format; fortunately my VHS player is still viable. Unlike Grand Hotel with its “cavalcade” of Hollywood stars, Cavalcade does not have a single actor that I would consider famous. I do not want to imply that the quality of the acting is lacking because I did enjoy most of the performances. Based on a play written by Noel Coward, the dialogue clearly borders on the melodramatic. This is our third film out of six where war plays a prominent role. Given that the film was produced in 1933 and that a vast majority of filmgoers would have experienced war’s trials and tribulations, I’m sure the subject matter had broad appeal. This film begins with the Boer War in 1899, progresses though World War I, and offers hope that another war may be averted (which we now know wasn’t to be). Along this journey tracing the lives of two British families of differing financial means, we experience the death of Queen Victoria, the sinking of the Titanic, the extravagance of roaring 20’s, and the rise of philosophies encompassing socialism, communism, Sigmund Freud, and religious and anti-religious thought. A particularly well done scene in the film shows a couple on their honeymoon cruise discussing life, their future and musing what if tonight would be their last. As they retire to their quarters, the shocking image of a lifesaver with the inscription Titanic is visible in the frame. Similar in feel to All Quiet on the Western Front, the film does not glorify war. The film however does evoke emotions in its contemplation of the meaning of life, the importance of living for the “now”, and the unpredictable nature of life’s journey. This film could not be considered a feel good movie as the brightness of the future is definitely in question. In fact, the beginning of the twentieth century seems to be a tumultuous time compared to the perception of the tranquility of the 1800’s. A comparison similar to today’s reminiscing of the quieter, gentler time of the 1950’s (at least as portrayed in television sitcoms). Technically, I thought the sound was among the best we’ve heard thus far, particularly the emphasis on quality sound effects from artillery explosion to train station whistles. Not to mention the clarity of the sound of horse hoofs on cobblestone in a funeral procession. The aging of the characters was better than we saw in Cimarron and very believable. Musical numbers effectively change in style as we progress through different eras. Cavalcade will not be one of my favorite Oscar winners but was unexpectedly interesting and enjoyable (even in VHS). The film, Cavalcade, shows a longitudinal history of two families in late 19th century to early 20th century England. In the course of this study, it is hard not to make comparison to the predecessors of this film that have also won the award for best picture. Cavalcade has unmistakable similarities to Cimarron in its method of depicting a family’s evolution through significant historical events. The tagline of the film, “Cavalcade – Picture of the Generation” creates an accurate portrayal of the events that had significantly influenced the lives of the upper-class London residents Jane (Diana Wynyard) and Robert Marryot (Clive Brook). Interestingly enough, Cavalcade was the first award to be won by an English production in comparison its American peer productions. The first event mentioned in the film, The Second Boer War, was a part of English history that I was not too familiar with. It was particularly interesting to see the juxtaposition of the Marryot children playing soldiers, as well as the ennui of the women on the home front, instead of portraying the violence of the war. Also, the scene transition from the cheerful men singing with interlocked arms as their families bid them farewell, to the main heroine checking the casualty list was particularly jarring. Throughout the film they continue to utilize the motif of a cavalcade, defined as a procession or parade on horseback that often depicts historical events and follows a long trail. The film’s title fits that description perfectly, as 30 years of British history is depicted through the lens of the family. The film also superimposes the imagery of a processional of horses over scenes of action to symbolize the fact that time is progressing. While this film does occur during two wars, both The Second Boer War as well as WWI, it shows a side of war that previous films have not depicted as much, the home front. The hardship of the Marryot family is also portrayed through pivotal moments of the 1910’s including a certain family member’s trip on an ill-fated cruise in 1912 aboard the “unsinkable” Titanic. Through the eyes of the family, we are able to gather an accurate portrayal of the hardships and pains of the English public during this era. While looking at this posterity it is also hard to forget the fact that at the time when this film was created,Englandhad yet to experience its most trying test in the form of WWII which occurred just 6 years after the film was made. One of the most interesting parts of the film was the montage sequence that portrayed the vice and the hedonism of the 1920’s. The sequence depicted Jazz-era flappers, a homosexual couple, the rise in atheism, and a complete reversal from the Victorian society portrayed in the first portion of the movie. These choices were particularly daring, and many of the depictions would not have been possible in Production Code eraHollywood, which would begin to censor films in 1934. The portrayal of homosexuality would never have passed censorship restrictions that would limit content for the next 25 or so years. Overall, I found the film emotionally moving and a better representation of a longitudinal character study than the more fragmented Cimarron. It’s more innovative technological advances on such a large scale also showed the biggest improvement in film production since All Quiet on the Western Front. The lesson in English history also familiarized me with a segment of world history that I was not well acquainted with, and I was glad I had the chance to learn about it through an insider’s perspective provided by an English film production. Grand Hotel is an unusual quirky film. 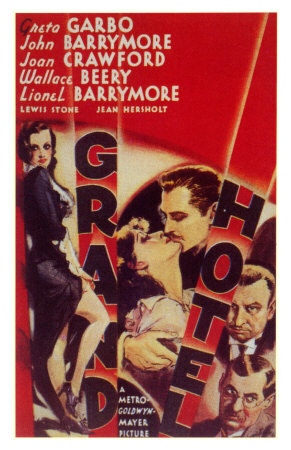 It features a blockbuster cast of stars including Greta Garbo, John Barrymore, Joan Crawford, Wallace Berry, and Lionel Barrymore and was billed as “the greatest cast in stage or screen history!” The story follows the lives of assorted characters during a brief stay at the Grand Hotel, a luxuriousBerlin hotel. Obviously, with a story involving so many characters, the individual backgrounds of the hotel guests cannot be explored in depth and, in fact, remain a mystery for the viewer to draw one’s own conclusions. Perhaps what brought the characters to this place is not as important as what their current circumstance appears to be and how each character deals with adversity. To me, the movie expresses certain truisms – one, good people faced with grim financial prospects will often be drawn to do bad things (such as theft or adultery); two, wealthy people faced with the potential loss of wealth will often do bad things (such as lying and murder); three, wealthy and successful people can still suffer from depression despite material comforts; and four, people facing imminent death can enjoy their remaining days because they are freed from the burdens of responsibility and conformity. I can’t help but feel the screenwriter was sending a message to all of those affected by the Great Depression that was still devastating the American filmgoer. I do not know whether the message that wealth does not lead to happiness could make a depression-era filmgoer feel better, but that’s the impression the writer appears to convey. If all this sounds confusing, it is because it is. Unless the viewer pays close attention to the dialogue, the interwoven vignettes would become increasingly difficult to follow. There were some interesting plot twists but I did not feel an emotional connection with any of the characters. I did enjoy seeing 1930’s glamour and the hotel switchboard scenes were a great reminder of a bygone era. The director presents scenes of the luxurious hotel with dramatic angles and interesting lighting effects particularly the shots from the top floor overlooking the open lobby below. Grand Hotel was the most eccentric film we have viewed so far in our quest to view all of the Best Picture winners. While the acting was a bit dated, the Grand Hotel touched upon certain societal themes that still ring true today. 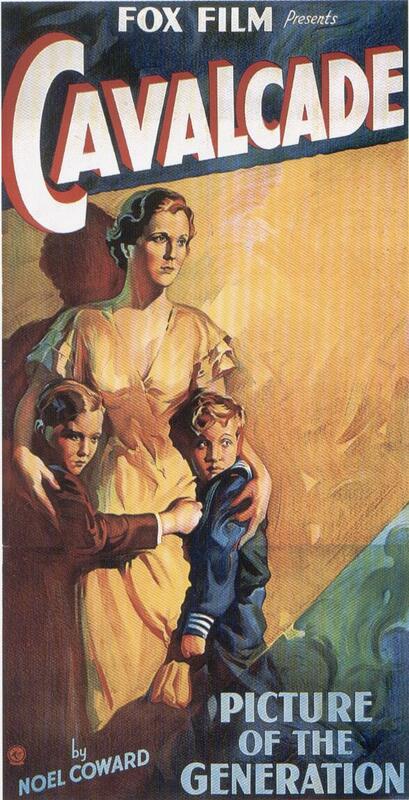 Especially in the dialogue between the haves and the have-nots, the depression-era socioeconomic divide clearly influenced the film’s moral compass. This film was another example of an ensemble piece that relies on a diverse character-base to provide a snapshot of life in a specific setting. Each character has a unique function, and represents a role from a different class or profession. Interestingly enough, this was actually the second film that we have viewed thus far to take place in Germany, a setting that will become infinitely less popular after the beginning of the United States involvement in WWII starting in 1941. While it is hard to compare the technical aspects of Grand Hotel to the more grandiose productions of Cimarron and All Quiet on the Western Front, the scene transitions were smoother than its predecessors and appeared to be a more finished final product. Grand Hotel also contained bona fide Hollywood stars, an aspect the previous films did not capitalize on. Greta Garbo plays Grusinskaya the beautiful and troubled dancer. John Barrymore (Drew Barrymore’s grandfather) plays The Baron Felix von Gaigern, a cat burglar and imposter. As well as a supporting role played by Joan Crawford as a stenographer, to help fill out the rest of the talented ensemble cast. My favorite member of the ensemble cast was the mysterious doctor (Lewis Stone) who would appear in different scenes and provide commentary about the characters in the Hotel. He delivers the famous tagline “Grand Hotel… always the same. People come, people go. Nothing ever happens.” This serves as the complete antonym of the reality of the situation, but draws the audience in with the force of the narrator of The Twilight Zone. Overall, I enjoyed the film and found it a nice mix of drama, quirk, and comedy. It was the first real glimpse we have had in our journey of the golden age ofHollywood. I left the finish of the film with great optimism both for what clearly had shown me the refinement I was looking for in these films as well as the fantastic movies we shall see in the future. I am a big fan of the Western film genre, thus I was anxiously anticipating this film which I assumed was a Western. 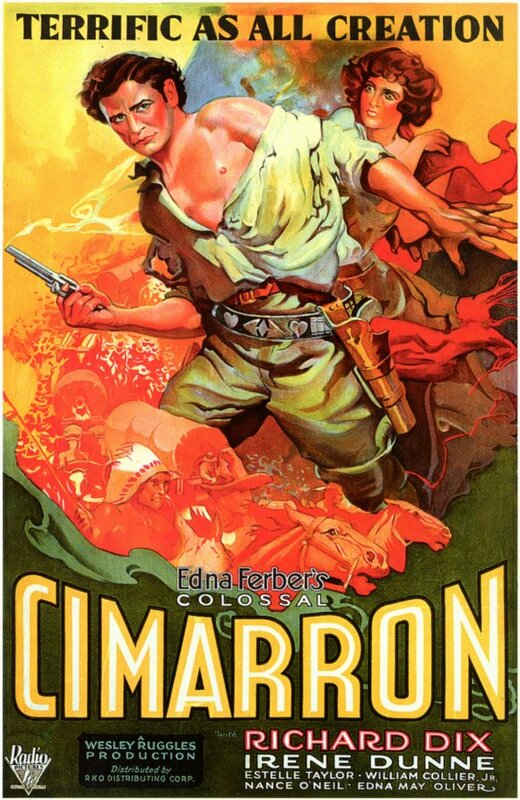 Although the film has elements of a Western, it would be inappropriate to consider Cimarron a pure Western. The film is an epic that begins with a classic scene recreating the Oklahoma Land Rush of 1889 and ends in the then modern day 1930. The Motion Picture Academy has always seemed to favor large scale epics and spectacles, and this Academy Award winner is no different. The most famous scene in the movie is one depicting the Oklahoma Land Rush, which involves a cast of hundreds racing across the dusty plains. The story, written by Edna Ferber, traces a family’s travails and evolution over a 40 year period. The changes in the family mirror the changes in Oklahoma from an untamed territory, to entering statehood and finally becoming an industrialized oil behemoth. Although I realize this is a fictionalized tale, the story of the Cravat family seemed a bit far-fetched. The father would leave for years only to reappear and have the family react like he had just returned from a day at the office. Possibly the novel explained these absences in greater detail then permitted in a 123 minute movie, but to me, the film story was lacking. The story of the Oklahoma territory was interesting and felt like a reasonable portrayal of historical events albeit with expected cinematic hyperbole. The movie did discuss prejudice and persecution of American Indians which I’m sure was eye-opening to many film-goers. However, the movie was also full of stereotypes regarding blacks, Jews, Indians, gold-diggers and prostitutes which I found amusing, but at the same time somewhat disturbing as these portrayals may have reflected widely held beliefs of this era. This is our second movie with a stutterer; obviously a common character role at one time which today would probably fall into the politically incorrect category – The King’s Speech an obvious exception. From the perspective of film technology, Cimarron does not represent any advancement from previous Academy Award winners and the choppiness of scene changes may have been a step backwards – possibly this is why the director opted to go uncredited. Although I’m a big fan of Westerns, I will have to wait until 1990’s Dances with Wolves before I see my next Western Oscar winner. Cimarron is a western of epic proportions that portrays the time period of the Oklahoma land rush. When I first sat down to watch this film, I really had no conception as to its subject matter other than its Western genre. However, Cimarron defies the classic classification of the Western genre because of its focus on the more political and social context of this new frontier. Oklahoma is depicted as the last hurrah of the Wild West, as the land which had been previously been allotted for Native Americans is opened up to settlers from across the country. The movie begins in a frantic dash of thousands of hopeful settlers, equipped with a myriad of different kinds of wagons and horse-drawn transportation, all hoping to gain a choice claim of the million acres of newly-opened land. Within the first five minutes of the movie, it is immediately made known that this film was made in the 1930’s through the characters’ attitudes towards race. The main characters Yancey Cravat (Richard Dix) and Sabra Cravat (Irene Dunne) are sitting at a table with Sabra’s parents, and Sabra’s father asks an unseen entity for more air. The camera then tilts up to reveal Isaiah (Eugene Jackson), the family’s African American servant suspended from the ceiling fanning the family with a palm leaf. I was personally shocked at such an image being portrayed on film, especially so nonchalantly. Yancey’s father-in-law next goes on a rant against Native Americans and how they are a dirty people. While Yancey is a Native American rights activist as shown through his editorials in the paper, the blatant racism is hard to ignore. The movie actually spans over 40 years, which is fascinating mechanism to allow us to watch the characters develop over such a large segment of their lives. However, spanning this stretch of time sacrifices significant character development and leaves the audience to try and connect the loosely connected dots. Yancey, the main male protagonist describes at the beginning of the movie that he can only stay in one place for a maximum of five years. This curious trope impacts the plot throughout the duration of the film, and the gaps in action are bridged by Yancy returning after 5 year stints of abandoning his family. While it could be said that he was supposed to embody the rambling and restless spirit of the west, to me his abandonment shows a certain emotional immaturity and resistance to commitment. The initial sojourn to Osage, the boom-town in Oklahoma where the majority of the action takes place, is the most exciting of the slices of life depicted in the film. Yancy arrives as the town is struggling to find a moral compass and suppress the outlaw population from ruling the town. Yancy, through his career as a writer and a lawyer had become acquainted with many of the new residents of Osage, and quickly become a folk hero. Keeping the town safe through both his quick draw with his colt pistol and his quick wit in his newly establish Osage Wigwam, Yancy becomes a predominant member of Osage society. However, after his five years is up, Yancy leaves his wife and children in Osage and heads further West. Yancy’s wife Sabra is left to run the paper, which while at some points shows her exhibiting agency as the empowered female editor of a newspaper, however she reveals that she left Yancy’s byline as editor and proprietor of the paper even in his absence. Sabra is the real unsung hero of the film, even becoming a congresswoman by the end of the story. However, the film really cut down the main heroine’s importance, instead focusing on the male’s impact to the town as compared to his wife’s contributions (which were far greater). Overall, this movie was an outdated but enjoyable look at the history of Oklahoma’s founding, however it does not translate into our modern society. Despite this failing, I still would recommend it to any fan of Westerns who is looking to see another take on this classically defined genre and also willing to keep an open mind to the early date of the film’s production.